A strong passion for real estate is what initially allured Leonie to the industry. It all started back at school when she decided to do some work experience in a Real Estate Office way back over 20 years ago. Leonie goes to great lengths to help clients understand the Sales process. Drawing on her own experience of selling and buying a home, Leonie knows the importance of keeping clients fully informed throughout a campaign, from initial discussions about the kind of price clients should seek through to the final point of sale. Leonie says “I know how important it is to feel like you’re in the driver’s seat when you’re selling your home, and I make it my business to communicate with clients about every aspect of their sale.” What defines Leonie is her genuine desire to make her clients’ experience of a sale as easy as possible. Leonie loves the community that she lives and works in and if you don’t see her with her real estate hat on you’ll find her down at the local Surf Club patrolling our beaches and giving a hand wherever she can. She also enjoys spending time with her husband and three daughters. Leonie’s knowledge as a local resident allows her to promote the genuine benefits of living here to potential buyers and communicate with them on a personal level. 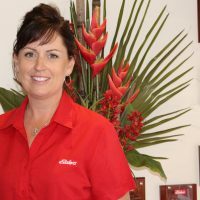 Leonie looks forward to helping you achieve the best possible result. Would you like to speak to Leonie?